An independent review has decided it is fair for Jersey Electricity to force standby charges onto businesses that generate their own power. Jersey Swimarathon are asking local businesses and organisations for sponsorship of the laps swum on each of the days. The airline Germania was due to operate FlyDirect's routes from this Saturday until the end of April, but filed for insolvency. It's one of 27 HMV stores closing after the sale of the business was announced today. A Retail Development Strategy draft will be completed by the end of the month, but some business owners say it has taken too long. Blue Islands says it "remains fully committed to serving the Channel Islands" after Flybe announced its sale this morning. Senator Lyndon Farnham says he is "optimistic" that Flybe's new ownership will present new opportunities for incoming routes to the island. 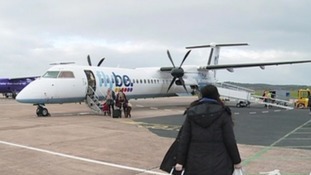 A consortium led by Virgin Atlantic and Stobart Group has agreed an offer to take control of Exeter based airline Flybe. Organisations could benefit from grants worth up to £5000 for "awareness-raising initiatives" that focus on equality and disability.